Horse Chute is a an old off-the-beaten-track route that shares the first 5 pitches of Dihedral Wall. It does not have the sustained aesthetics of Dihedral's long leaning corners but has a few drop dead gorgeous pitches. 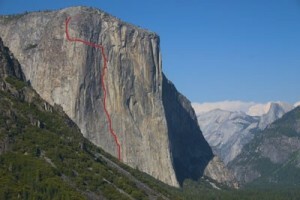 It has probably the most stunning single corner on all of El Cap. Which SuperTopo guidebooks include a topo for Horse Chute?